Susan Lamont's technical virtuosity is easily evident in her work as is the deep intellectual seed that germinates in nearly all of her work. Check it out on level two of Artomatic. 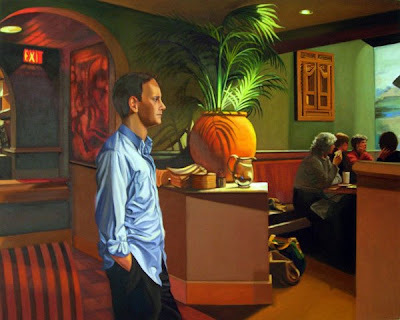 He Searched the Room For Her Auburn Hair © 2009, oil on linen, 40" x 50"
I've been searching for the best pizza in the United States since my teens, when a slice of pie was a quarter and there were a dozen pizza places along Pitkin Avenue in Brooklyn. Best pizza that I ever tasted was in Sicily, and the worst one was in London. Best pizza in America is at Little Anthony in Media, PA.
Anthony is a Napolitano, and his pizzas are amazing, especially the garlic white pizza. His is the best pizza that I have ever eaten in the US. Best pizza in the South? Andrea's Pizza, located in the Riverdale Shopping Center off West Mercury Blvd in Hampton, Virginia. NALAC Fund For the Arts offers funding to Latino arts organizations and to Latino artists for the creation and presentation of work, as well as career development. Funding available for the following disciplines: Visual Arts, Dance, Interdisciplinary Arts, Literary Arts, Media Arts, Music, Performance Art, and Theater Arts. Phone: (210) 432-3982; email: grantmanager@nalac.org; or check website: www.nalac.org.